Design of the room in a nautical style involves the use of decoration and finishing materials that are associated with the sea, beach, ships. Freshness, special beauty and spirit of adventures – all this embodied in a marine style. 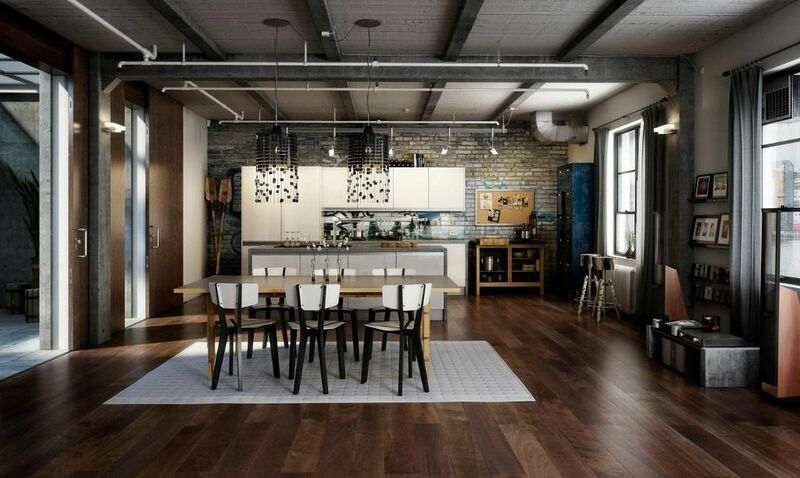 It is appropriate in the interior of the apartment, in the design of townhouse, beach house, beauty salon, restaurant or shop. Marine style in interior design of real modern apartment or house is rare, but this style is appreciated by those who adore the charm, ease and beauty of the sea. Cottage or house ashore of the Sea will look organically in the Marine style. Treasures: chart on the wall or on the ceiling, the figurines in the form of steering wheels and anchors, ships and boxes on the shelves, a treasure chest for books clothes and little things instead of the cabinet, tropical motifs in the design. Recognizable decorative elements: starfish, pebbles, coral, shells, helm, anchor, ship model and so on. Nautical style in the interior of a beauty salon, restaurant or home – it’s the freshness of the sea, the warmth of the beach and the atmosphere of wandering. Where does Marine style appropriate? Nautical style is versatile enough: you can order the interior design project for the fish restaurant or sushi bar, a country house or a city apartment, a beauty salon or a hotel – Nautical style will look organically everywhere. Especially if the premises located near the water in the hot climatic zone. Marine style in the interior of SPA salon is a calmness of the sea, it is the beauty of coastal land, is the noise of shells and the rustle of the wind, that is a perfect atmosphere for relaxation, for escaping from the everyday hustle and bustle of the big city. The interior design of the hotel, boarding house or recreation center in marine style – it`s a combination of pleasant natural shades, this is antique furniture and natural fabrics, this is cozy seaside and the special spirit of sea travel. In such a hotel or boarding house everything sets you to the relaxation and serenity. Marine style in interior design apartment – it’s freshness, harmony and beauty. 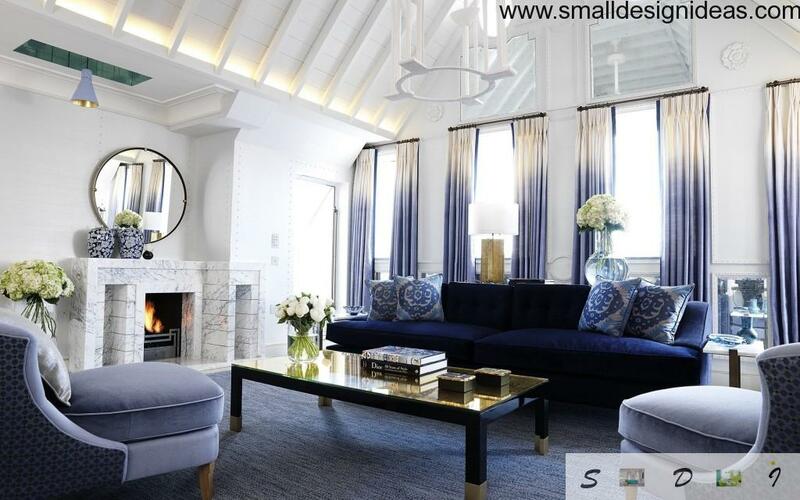 The design project of an apartment or house in the Marine style is for all those people who appreciate nature, dreams of travel and dreams of living in a strict and at the same time cozy atmosphere. 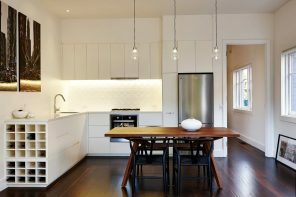 Kitchen in a marine style may look like a galley, and can simply be decorated in brown and beige tones with themed decor. White-blue color gamma with elements of brown and blue colors is also appropriate. 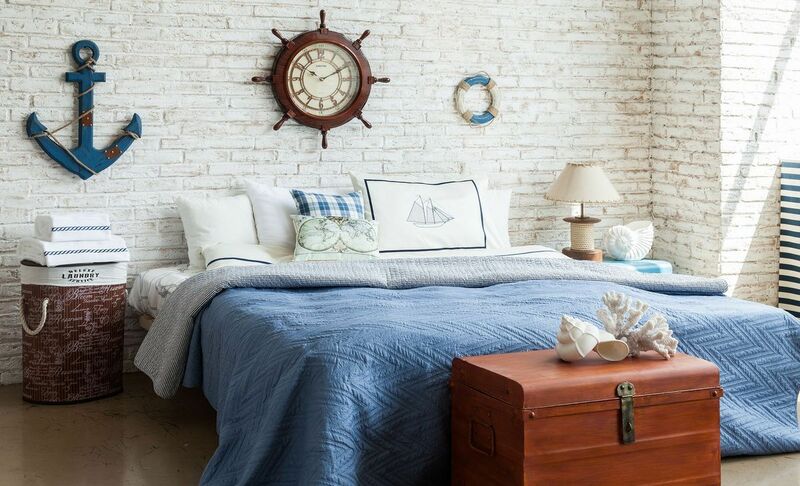 Bedroom in nautical style – it is a custom picture with the image of sea landscape, blue or blue-white color scheme, wooden or wrought-iron bed, light curtains or light bamboo curtain. Bathroom in a Marine style looks organically: white, blue, cyan, themed decor (fish, buoys, shells, etc.). The imitation of pebbles or sea sand on the floor would be appropriate. Wallpapers with marine life, soap dish in the form of shells, hooks for towels as anchors, etc. is also should be included. Living room in a marine style: ship models or stuffed fish, shells, jellyfish, caskets, an hourglass, a steering wheel, a lifeline (but not all at once! ), wooden furniture with wicker elements, decorated with rope or artificially aged. Aquarium would be appropriate in such a living. You can also order a painting to the walls and decorate them with waves, nautical chart or a silhouette of a ship. 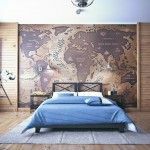 This style surely be favorite for a small fans of pirate and adventure stories, so if your kids love watching “Pirates of the Caribbean Sea” or read ” Captain Blood: His Odyssey “, you should order the design of a child’s room in a nautical theme. A great decor option is custom toy in a form of sailing ship. For children’s room with maritime interior imitation of lifeline, and rope ladder, and a hammock – all this will be appropriate. 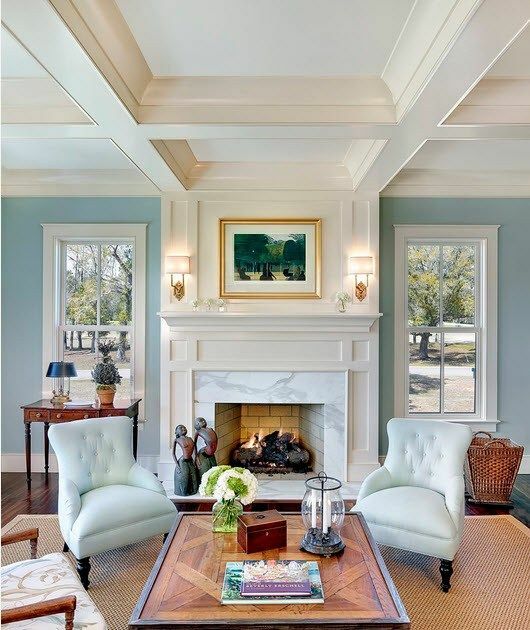 The interior in maritime style – it’s nice and bright option. If you have never been to the sea, colorful photos will help you to appreciate the charm of this style. 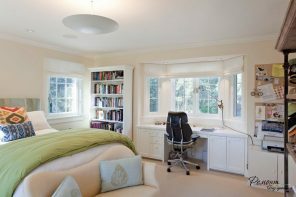 Why Marine Style Interior Design? Nautical interior style – it is comfort and harmony, elegance and special charm. Natural materials: wood, flax, cotton, hemp. As you can see from the pictures and from the given information, the Marine style is more about finishing materials, accessories and used colors. You can easily turn almost any interior into nautical or to add some sea accents just with a couple of pillows. So, in a sense, this interior style is for experimentators and creative people.